I apologise in advance if you start reading this and think, I’ve read this somewhere before. It’s because I want to reference an article I sent to Cask Marque back in 2013, but it has relevance when talking about this week’s beer. Back in 2013, I went to Bruges for the weekend with my other half. I had heard many other beery people talk about how fantastic Bruges is, and we both felt it was a gap in our beer education. So under the guise of widening our knowledge we planned a trip to do some sightseeing, walking, but most of all to experience the beer. I’m a massive fan of Belgian beer and looked forward to sampling some unusual, quirky and inevitably strong beers. It was as beautiful a city as I’d anticipated (especially as it was snowing) and we visited a LOT of bars. Every beer was served in the correct glass, every bar had a beer menu rather than a wine list, and every beer we ordered was brought to our table. Service was exceptional and on more than one occasion we were recommended a beer by the staff. It was Beer Paradise. But over the three days we were there, we never once sat at a bar, we didn’t engage with other customers, and we didn’t discuss the weather with the bar person. We were served our beers at the table, and chatted to each other, and played cards, and Yahtzee and hangman (yes, really). It was a totally different experience to going to a British pub. The beer was amazing, don’t get me wrong – but something was missing, and it took somebody else’s story to make me realise what it was. A couple of our friends emigrated to New Zealand in 2011. They are both massive real ale fans and used to be regular customers in our pub. They love their new life, but they’re a sociable couple who adore their beer, and one of the things they told me they miss was not being able to drop down to the local pub. There is no pub culture in New Zealand, no popping out for a couple of pints after work because the distances to travel are too huge. Socialising for them has now taken on the form of going round to friends (early evening) for a barbie, with a few bottles of ‘beer’ thrown in. No sitting at the bar, bumping into people you haven’t seen for a while. No getting to know new people through a shared love of a particular beer, or a common interest, or a mutual friend. No standing at the bar inspecting the range of pumpclips and trying to decide what you’re going to start with. They returned for a visit late last year and the first pub we visited had Hop Back Summer Lightning on tap. Their excitement was uncontrollable (believe me, they don’t get out much). Their reverence for this beer was unrivalled. They have nothing in their adopted country to match the sheer brilliance of this 5% ‘summer’ beer. I know I use the word ‘iconic’ a lot, but Summer Lightning is one of those beers which ticks my 3 point iconic beers list every time. 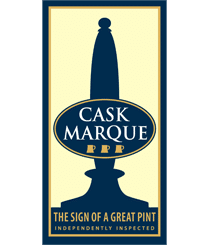 Without doubt, it will still be around in a hundred year’s time; it sticks to the original balanced recipe; and finally it demands a ‘second pint purchase’ just to make sure the second is as brilliant as the first. The brewery has been through a chequered history but hey, what the hell? It’s a winning formula and as long as no one tinkers with the ingredients, the strength or the branding (all a bit ‘Wicker Man’ which makes it all the more intriguing), I don’t care. Summer Lightning is the Cloudy Bay of the beer world. A world class dry, crisp, fresh beer. Snappy and spine tingling. Put it with crispy calamari, chilli prawns or salt & pepper crab and it beats wine hands down, any day of the week. As I waved my friends off at the airport I noted that whilst pubs may sometimes get it wrong with service, or quality, or environment, we’re very, very lucky to have such a unique culture of diversity and variety in our beer range. And the rest of the world might want to look on and take note.